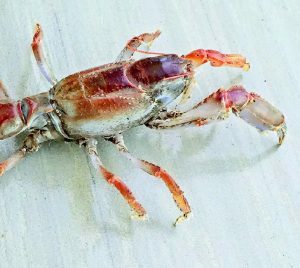 There are some months in the year when, aside from the kuday, alimango, tagoykoy, and ghost crabs, another creepy crawler is in great abundance: the Manla. Sorry to say, I don’t know the English name for this creature, so I would appreciate it if any reader can tell me what it is. I am sure that they are always out there in the muddy mangrove swamp the whole year round. However, you cannot harvest them during some months because you have to spot the burrow first. If it is always raining, or if there is much tide movement in the swamp, the burrow of the Manla will be very hard to spot. Thus Manla hunting can only commence when the water recedes due to low tide or the dry season. The burrow is actually covered by the excavation quarry of the Manla. Since it lives in the mud, the Manla has to push mud out of its burrow everyday. Thus, on top of the burrow is the newly pushed mud that looks exactly like a heap of carabao or cattle dung. So the first thing to do when hunting Manla is to look for that heap. After spotting the biggest heap (and making sure it’s not an actual dung heap since there are a lot of carabaos around here), gently and cleanly remove the heap from the muddy ground with a shovel or a bolo. With the heap out of the way, you can now see the Manla burrow, which is a little smaller than a Tagoykoy burrow and roughly the size of a golf ball. Using the shovel or bolo, carefully dig out the mud while keeping track of the direction of the burrow. The burrow will usually be about a meter in depth, either going down or going somewhat sideways. Nowadays, hunters like to use chemicals to flush the Manla out of the hole, rather than digging them out. Naturally, I am opposed to this method as I am similarly opposed to catching giant river shrimp using electricity (a story I hope to tackle in a future issue of Animal Scene). With the Manla out of the hole, you will notice that it is a very curious creature indeed. It looks like a crayfish but with a rather slender tail. That is why seaside settlers do not bother much with the Manla unless they are really big. Otherwise, there isn’t much meat to have. Maybe this is also the reason why Manla has not become a popular quarry even with the earlier settlers, who are basically farmer-hunters who like to hunt for bush meat and delicious seafood. But then again, when you have a kilo or two of Manla, they make a really fragrant soup or a delicious buttered crustacean dish. Another difference the Manla has from the crayfish or American/European lobster is the shape of the pincers. 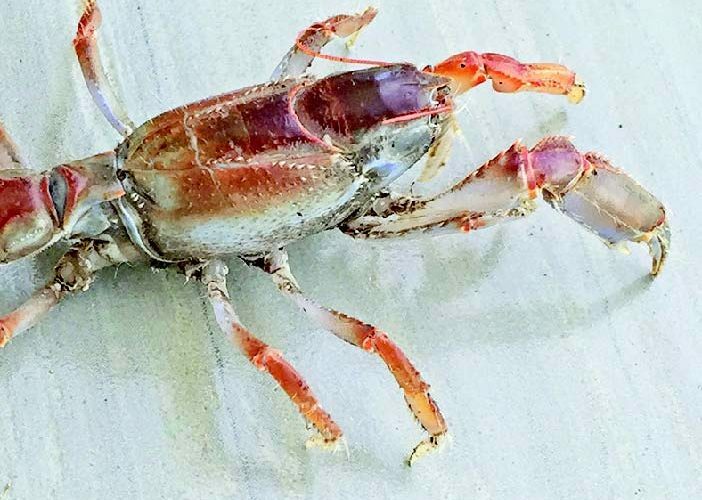 While those of lobsters and crayfish are big and muscular, and thus have a lot of meat in them, the pincers of the Manla are odd-shaped and adapted for digging. 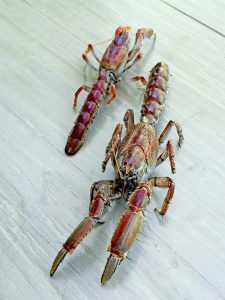 In fact, the shape of the pincers of the Manla are odd and awkward, so they cannot make a clean pinch or hold of objects, while the pincers of lobsters, crayfish, and other crabs are much more balanced, so the upper and lower part can either have serrations or sections that fit into each other or at least have counterparts on the other side that provides that creature with a stronger hold on objects. The pincers of the Manla are wide and flat in a vertical manner. I surmise that this is necessary for them to shovel mud out of the burrow. Don’t get me wrong, though; their pincers are very strong and can sometimes pry my grip off of them. Such was my experience when I was about 7 years old. I caught a big Manla, but it was able to pry my grip off its body and escape into a pile of rocks. 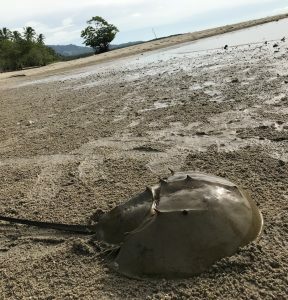 On my latest visit to Manong Valdez’s, I saw in his “coopantry” the Godzilla of crabs: the Horseshoe crab or Barangkas. Funny thing though, the Horseshoe Crab is not actually a true crab. 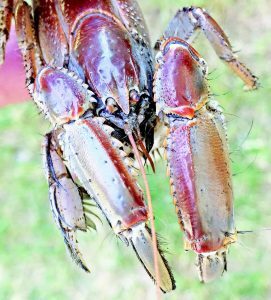 According to the Florida Fish and Wildlife Conservation Commission, Horseshoe Crabs are more closely related to spiders and scorpions (arachnids) than to crabs. Maybe this explains why the underside of the Barangkas looks like something that came out of a horror movie. The research center states that the Barangkas predated the dinosaurs and the design of their body has changed little since the rule of the mighty T-Rex. It says that presently, there are only four known species of the Horseshoe crab. One species is found in North America, while the other three can be found in Asia. Everytime I see a Barangkas, I am always reminded of a soldier’s helmet, because this is how they look like when sticking out from the water or sand. I estimate the biggest Barangkas that I have encountered would be about ¾ of a meter in total length, with the tail accounting for more than half the length. I was surprised to see this specimen at Manong Wilson’s place because it was very near the ¾ meter mark. As I did not have a measuring tape with me, I had my son pick it up so I could gauge its size relative to my son’s height. Knowing that they are so much rarer now, I consider myself very lucky to have seen and taken pictures of a specimen that big. During my childhood, there were some occasions when we would literally run into a Barangkas while playing in shallow waters. It would raise up its tail threateningly in a defensive posture. This used to scare me. But now, knowing better, there really isn’t much that the Barangkas can do against a human being, even a small child. In fact, it would be more to its advantage if it stays still or plays dead, because the easiest way to handle it or catch it is to grab it by the tail. The tail, while having a sharp pinnacle at the rear, does not present any danger to anyone, unless you poke yourself with it or accidentally step on it. 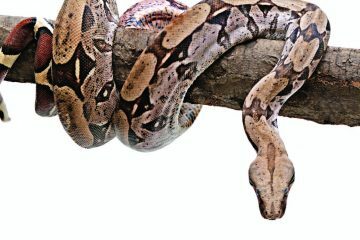 A word of caution: if you ever do come across a Barangkas, do not lift it up by its tail. 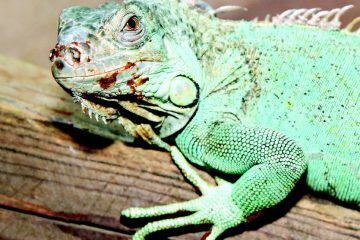 This will injure the animal by tearing the muscles and connective tissues on the junction area of the tail to the body. This is particularly true for bigger and heavier specimens. Without a tail or with injuries on the junction area, the Barangkas cannot navigate properly. This is what I have observed with the Barangkas that I have rescued from local kids. They usually have partially or totally torn tails. A Barangkas out of water, even with a healthy tail attached, has to exert a lot of effort just to crawl for a few meters. In the water, it is still sluggish but can move about with less struggle. Imagine a vintage war tank trying to navigate in the soft sand. That’s how the Barangkas move about. I have taught my son to handle it carefully, by lifting it up by the carapace where most of the weight is, and with the other hand on the side of the carapace or the tail just for balance. Aside from my personal experiences with the Barangkas, some of the knowledge that I have of this animal came from seniors like my uncle, a licensed medical physician and an entomologist on side. He is an avid collector of insects and arachnids and he also has a few specimens of Horseshoe crab in his “lab.” He said that Horseshoe crabs have numerous pairs of eyes located in different parts (except for the tail, of course). I do not fully understand how these eyes work and it never occurred to me to look for the eyes of the Barangkas that I have come across. I have to remember to look for the eyes in my next encounter with this creature. As for the general appearance of the Barangkas, I think it would be for the best for me not to explain it in writing. Not only that it would fill up 10 pages of the magazine, some readers would probably imagine an entirely different creature from my failed description. For this reason, I have taken a lot of pictures of it from different angles. The pictures I have are taken of two different specimens, both of respectable sizes. According to my uncle (and what I happened to catch on Discovery Channel), research centers in Taiwan and USA harvest the blue blood of the Barangkas for medical purposes. The blood of these animals has the unique ability to react in the presence of bacterial endotoxins, and this makes them invaluable in the medical field. There are issues as to how the blood can be harvested without causing permanent harm to the Barangkas, but I am not knowledgeable enough to comment. What I know for sure is that the old locals used to consume Barangkas as food. In fact, my uncle said that he has tasted Horseshoe Crab meat. 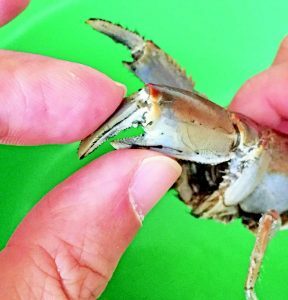 He said it is a little bland compared to regular crab meat and sometimes has a bluish hue, which makes other people hesitant to eat it. While the Barangkas is not yet endangered, their numbers have been on the decline. In Asia, habitat destruction, human activity, and consumption as food are major factors. 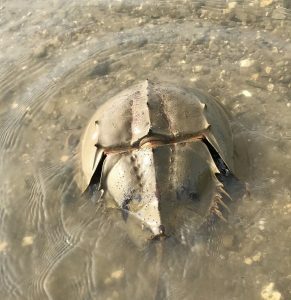 In more developed countries, the major threats to the Horseshoe Crab are the unsustainable harvest of its blood and human activity. For people like me, who had regular encounters with this creature, we are aware of how much rarer they have become. However, the immediate concern is not the extinction of the Barangkas. They are such an important part of the ecosystem that a decline in their numbers will have a big and negative impact on other animals. 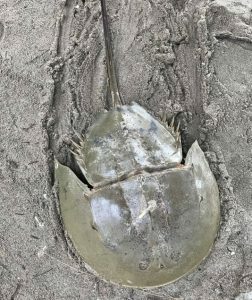 Because of their reproductive behavior and the thousands of eggs they lay in a single mating season, Horseshoe crab eggs are an important food source to many kinds of animals. In some areas, they are a vital source of food for migratory birds, who need the important recharge after a very long period of flight. The thousands of hatchlings are also an important food source for the sea creatures in the immediate area. For this reason, the importance of this animal, and the prevention of its extinction cannot be understated. Saving the Barangkas is also saving all the animals that depend on it for their food. A common problem of animals I have written about is that they are heavily affected by human activity. Our apathy to our surroundings and our irresponsible lifestyles are causing these animals to struggle just to exist. Seemingly innocent activities such as riding motorcycles on the sand, beach partying, or transferring sand from the beach to our backyard playgrounds are actually detrimental to the ecosystem. The absence of regulation on the use of anchors in famous locations such as El Nido and Honda Bay is also a major cause of harm. Corals and sand dwelling creatures are threatened by the indiscriminate dropping of anchors. I hope each of us will try to be a little more sensitive as to what we do during our excursions. Going back to this impressive specimen of Barangkas, I am glad to point out that we were able to convince Manong to release this living fossil back to the water where it belonged and cross it off the menu.